Grooms cakes, while not as standard or traditional as they once were, are now opportunities for brides to surprise their husbands-to-be. Of course, popular stand-by choices are anything sports-related. This cake is no different in that respect. We have certainly done our fair share of sports balls, team logos and jerseys. This Boston Red Sox cap, however, also includes a team pennant flag. Grooms cakes are also a great way of including something fun, creative and bold without breaking the bank, because the cake doesn’t have to feed every single one of guests as the wedding cake usually does. A modest size of anywhere from 20-40 servings should be reasonable. The grooms cake might offer an opportunity to also offer a more non-traditional cake flavor; for example a peanut butter buttercream, or red velvet cake. 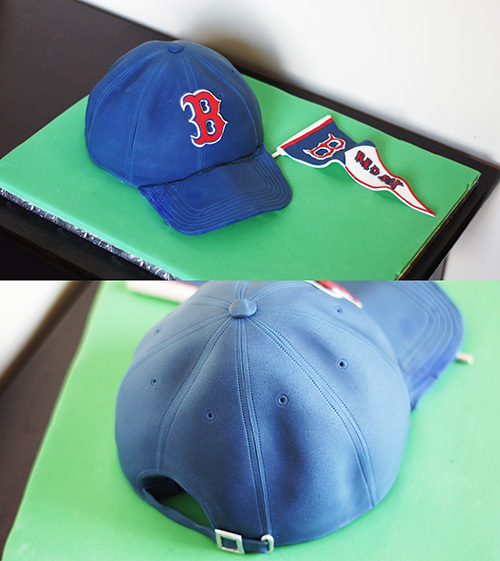 A grooms cakes doesn’t have to be sports-related. Let it be anything that interests your special someone. Some cakes that might interest you are the Diet Coke Cake, the Tomato cake, or the Dog Cake. Also be sure to check out the Liverpool Soccer cake and the Air Jordan Sneaker Cake as more sports-related cakes.